There is something about caramel that I just can’t resist and I’ll take savoury over sweet everytime unless it involves caramel. I recently had a caramel tart at a restaurant and I recreated an easy version for dinner at friends. It was so good that I forgot to take a photo and I had to look around the table to see which tart was still slightly intact. My food is always made and served, I don’t have the luxury of making specific things to photograph for the blog, perhaps one day when my Mum duties wain. Anyway not to digress too much from the dessert at hand. 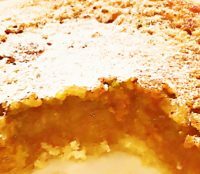 This dessert looks impressive, homemade pastry always has the wow factor, but this pastry takes minutes to make in a food processor. It’s my friend Mary’s mum’s recipe and it is always a winner. If you don’t have individual tart cases you can make the dessert in large tin, or in a muffin tin, brownie tin or small cake tin where you can cut and serve pieces. The caramel may ooze a little when cut, but trust me no one will mind. This would make wonderful Valentine’s dessert, dinner party desserts or if smaller tarts were made or smaller squares cut, they could be served with an Afternoon Tea menu. The joy is that the making can be broken down into stages if you are time poor. If you need to get ahead you can make the pastry the day before and assemble and bake the tarts up to 12 hours before serving, you just need to keep them refrigerated. Although within just over an hour start to finish you can have an impressive dessert. I served my caramel tarts with a few crushed pistachios scattered on the bottom of the tart, before the caramel was poured over. This is an optional step and you could add almonds, pecans or omit the nuts completely. I liked the idea that when the caramel tarts were eaten the guests had a lovely little surprise to crunch on and they turned into a talking point. You could also offer caramel and salted caramel tarts sprinkling a lovely natural salt onto the tarts to give you the contrasting flavour. Instead of offering cream on the side, I offer mascarpone cream. I mixed mascarpone cheese and crushed pistachio nuts (you could omit this or add any of the other nuts you may have added to your tarts), sweetened with enough icing sugar to suit your tastes – I usually add about three heaped tablespoons for 250ml of mascapone. When I plated and served the individual tarts I scattered a few pomegranates seeds onto the plate. This added extra texture and a little bit of colour onto the plate. For a little aesthetic lift, I also sprinkled icing sugar over the top of the plated tarts. For Valentine’s you could make a heart cut out in a heart shape and dust a heart shape onto the top of the dessert. 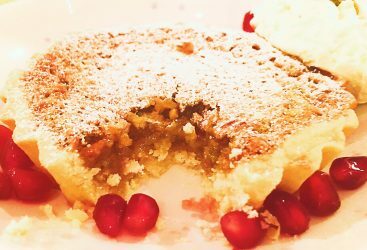 A lovely rich, indulgent caramel tart enhanced with optional pistachio nuts and a scattering of pomegranate seeds, served with a luscious mascarpone cream. Enough icing sugar to suit your tastes - I usually add about three heaped tablespoons for 250ml of mascapone. In a food processor add the butter, flour and sugar together. Add the egg and blend until the mixture comes away from the sides and forms a ball. If the dough is crumbly, add a few drops of cold water to bring the dough together. Allow the dough to rest for 20 minutes in the fridge. Lightly grease 8 individual tart cases with removable bottoms or one flan dish. Roll out and line the flan dish/es with the pastry. In a large glass bowl and using a hand whisk, mix together the maple and golden syrups, eggs, sugar, butter and vanilla essence, mix until everything has been amalgamated. Place the pastry cases onto a baking tray, it makes them easier to remove from the oven. If using add a sprinkling of pistachio nuts onto the base of the pastry cases. Open the oven and place the baking tray with the pastry cases into the oven. If you are using nuts add a sprinkling to the base of the case/s. Then pour the syrup mixture into the pastry case/s. Bake the caramel tarts in the center of the oven at 180°C or 160°C Fan for 45-55 minutes for the large tart and 20-30 minutes for the individual tarts. The tarts are ready when the pastry is golden and the caramel is firm to the touch. Allow the tarts to cool and refrigerate until needed. Beat together the mascarpone with the icing sugar and fold in the crushed pistachios. Spoon the mixture into a serving bowl and refrigerate until needed. Serve the tarts warm with either the mascaprone cream, whipped cream or with ice cream. When serving you can also I scatter a few pomegrantes over the dessert for extra texture and a little colour on the plate. The colour of the tart is brown and whilst I do love brown food for a little lift I sprinkled icing sugar over the top of the tarts. These tarts are delicious and the texture of the caramel is smooth and one that you and your guests will love. When you make this recipe please do let me know how much you enjoyed it and if you are on social media please send me a photo of your creation.